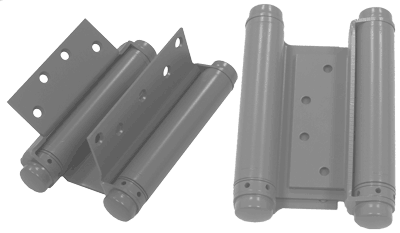 •Double acting spring hinge is designed for 1-3/4” stock hollow metal or wood doors. •Door flange is designed to fit standard 4 1/2” x 4 1/2” template mortise. •Permits doors to open in either direction and automatically return to the closed position. •See template for exact dimensions. •No hanging strip is required on frame. Jamb flange is surface applied to jamb. DA-81 6" x 4.5 "
It is advisable to use three hinges on a door. The center hinge should be installed as close as possible to the top hinge for maximum support. Hinge capacity decreases as door height decreases. Request template from factory for door and frame clearance required.